Car manufacturers often make special or limited production vehicles. However, very few take it to the level and extreme Porsche has. First they released the model 997.2 GT3, then the critically acclaimed and even more extreme GT3 RS. But now they’ve really done it. Porsche has taken the GT3 model line to the very limits of what seems possible with a flat six-cylinder engine, producing what could be, the very essence of a street and track car. Enter the GT3 RS 4.0. The vehicle, which will be limited to only 600 units worldwide, has the largest displacement engine ever offered in a 911, a 4.0-liter flat six punching out 500 hp at 8,250 rpm and 337 lb/ft at 5,750 rpm. That’s 50 horsepower more than the GT3 RS with a 3.8-liter flat six. In addition to having the largest engine the GT3 RS 4.0 has the most powerful output per-liter of any 911 engine ever produced, with 125 horsepower per liter. All of this horspower, and a power to weight ratio of just 5.99 lbs/hp allows this special 911 to accelerate from 0-60 mph in 3.8 seconds, unchanged from the regular GT3 RS. However, while the 0-60 times might be the same, the difference in track times between the GT3 RS 3.8 and 4.0 on the Nürburgring-Nordschleife racetrack are drastic. The GT3 RS 3.8 recorded an official time of 7 minutes and 33 seconds, while the 4.0 lapped the famous “Green Hell” in 7 minutes and 27 seconds. Six seconds might not seem like a lot, but in the world of motorsports it’s a lifetime. This improvement is possible because of weight reduction. With carbon fiber sport bucket seats, carbon fiber front fenders and luggage compartment lid the GT3 RS 4.0 weighs in at only 2,998 lbs (full tank of fuel). Other cosmetic changes include large rear wing and speical “4.0” badging on the engine lid and lower left-hand corner of the doors. The GT3 RS 4.0 also has a unique gray line, with red accents running from the nose of the hood all the way back to the rear. 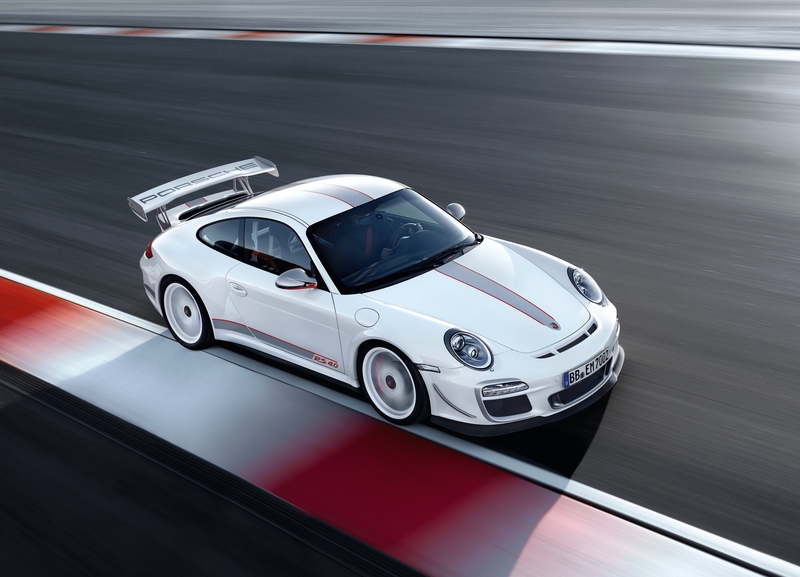 The GT3 RS 4.0 is available in Carrera White and will go on sale in the U.S. beginning in late 2011 at a base MSRP of $185,000 (plus destination). It’s a good looking black GT3 RS 4.0 a standard color but pictures are not on other sites. I would definitely agree that black is much better looking than silver on the GT3 RS 4.0. It looks much more aggressive and menacing. Thanks for checking out my site. Make sure to stay tuned for new stories, photos and videos in the next few days. Yeah I will, a very nice site btw!